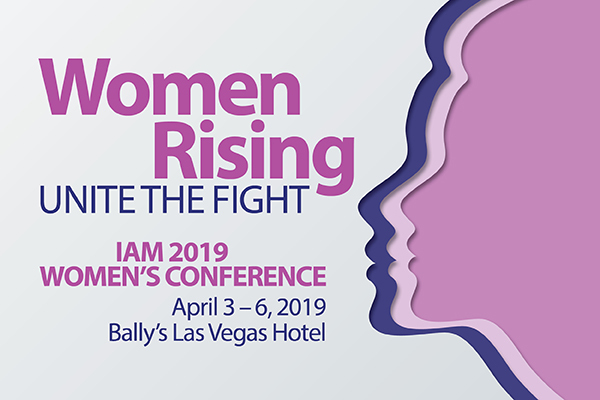 “Women Rising: Unite the Fight” is the theme of the 2019 IAM Women’s Conference, and your T-Shirt design could be the winning entry to promote the event. Judges will award prizes of $500, $300 and $200 to the top three entries. Check out the rules and submit your design by the February 01, 2019 deadline. The women’s conference will take place at Bally’s Las Vegas Hotel April 3–6, 2019. The official call letter and registration information are available here. Special room rates and discounted registration are available until March 3, 2019, so don’t miss the opportunity to take part. You may also book rooms by calling the Bally’s reservation center at 702-967-4111 or 800-722-5597 and request the group rate for the IAMAW Women’s Conference, or use the group code SBIAM9. Please be aware that there is an additional processing fee for telephone reservations.